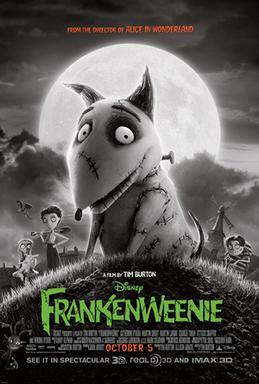 Frankenweenie is the latest from Tim Burton. From his previous short film, this feature length version is about a boy who loses his dog and longs to bring him back, a modern take of Frankenstein. The good; it’s black and white, I mean, who else does black and white these days? Love the feel that it adds and you don’t even notice. The film starts off right away introducing us to Victor, our main character, we waste no time connecting with him, bravo in the way they were able to pull that off. Granted, it’s sorta biased to people like me, film school graduates and what not. At first I thought, “why make this a full length feature film, when the short film was fine?” But they made wonderful additions to fill the runtime of a feature. We get more characters and complications in the plot, building to a wonderful ending. There’s a nice touch with the science teacher and his view on science. As Victor’s mentor he’s a shapeshifting one, you don’t know if it’s a good guy or a bad guy, he’s designed to scream bad guy but his message to Victor, as well as the audience, is surprisingly meaningful… wrapped in humor at times. The bad; not much here, you either love Tim Burton’s character design style or you don’t. Personally, I didn’t mind it, but I can see it turning others off. This isn’t necessarily a kid’s movie, I’d say it’s for mature kids, kids that can comprehend what’s going on, and see the deeper message behind the scary images. There are some frightening scenes, which help punctuate the message of responsibility and love. Overall, worth watching. The setting is timeless, not exactly a period piece, but just a timeless suburban small town that may or may not have existed in history, except in the way that we remember it. It was also great to see the cast of the original short film thanked at the end. John August and Tim Burton have teamed up again for another success. This entry was posted in Movies/TV, Reviews and tagged film review, Frankenstein, frankenweenie, frankenweenie movie review, john august, movie, movie review, Tim burton on October 5, 2012 by Eugene.